Spicy Red Fruitcake ensures Premier viewing | Stand, spray and deliver. Manchester United vs Liverpool. She’s a certified spicy-a-meatball every time. One day we will be doled out a soulless 0-0 draw complete with some chamomile tea at the interval, no bookings, and all played in front of tranquil fans who link arms together to sing Kumbaya, which will finally mark a break in the cycle of chaotic abhorrence. But until then, let the madness ensue. For the irregular round-ball follower, these are the games that you stay up for on a Saturday night. Get the lads over, put on a bet and watch the 2 traditional red-dogs from the Mother Country tear each other to shreds as you move into your 11th lukewarm beer. In all honesty, you wouldn’t change this recipe for quids. I don’t know how it happens, but the moons seem to align to produce subplots whenever these 2 leviathans clash which multiplies their hatred to scalding point. A serene opening to the match. How about a little dash of racism to amplify tensions? It seems that any type of provocation is warmly welcomed when they catch-up for a game and a proverbial kick in the Umbro-marked rocks. And if you thought that the froth and bubble from one game of this behaviour was enough, then you were well and truly force-fed dessert on Saturday night. In true theatrical villain style, it was the same fruitcake who kicked off the mayhem. It seems an abrasive maniac like Luis Suarez was tailor-made for the industrial oven of these fixtures, and he took his reputation in the folly stakes from prince to king on Saturday by laying the slipper into the hive of wasps he created from the last match. 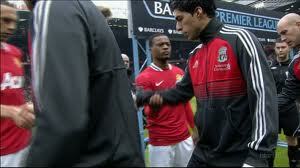 An uncomplicated handshake with Patrice Evra to end the feud in the pre-match procedure was too much for Luis so he simply refused. The situation was primed to be hosed down but he took the alternative option of the orthodox brush, which was not roundly accepted by Evra and his teammates. What unravelled from there were scenes of untainted looseness. 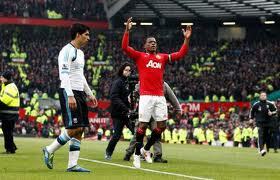 Whilst Evra seemed ready for the hatchet burial at the handshake, by game’s end he had made his resentment known in the halftime tunnel as well as in front of Suarez at the Stretford End of Old Trafford at the final whistle, where all of the hyper Manchester enthusiast geezers live. Then it kicked off with the bosses. Liverpool boss Kenny Dalglish fired back by defending Suarez and verbally ripping the television interviewer a new behind for daring to lay the blame at the feet of the barmy South American. It seems blind loyalty and the lack of a telly for a replay in the coaching dugout had Kenny trotting out this defensive gem. In addition to all of this hoopla was a pulsating 2-1 win to United which kept up the tasty contest at the summit of the Premier League with their other detested rivals Manchester City, whom they also regularly kick nuts against. Bloody fantastic cuisine from kick-off to f*ck-off. 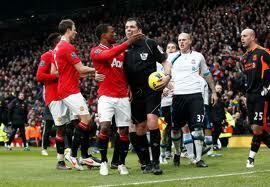 Now I’m not propping up racism, nor peanut behaviour in general from loaded footballers on the other side of the planet. But you can’t deny this 90 minutes of lunacy was fookin’ gold!